The increases were largely driven by incidents in Ontario and Quebec, Statistics Canada says. The agency said the increase may have been driven by more people reporting hateful incidents to police, although it says that many likely go unreported. In the worst incident in the country, six Muslim men were shot to death and others were seriously injured during an attack on a Quebec City mosque in January 2017. This spring, 28-year-old Alexandre Bissonnette pleaded guilty, but said he was not Islamophobic and instead "carried away by fear and a horrible form of despair." Quebec reported a 50 per cent increase in the number of hate crimes in the month after the mass shooting, mainly driven by incidents with Muslims as the victims. Police are also dealing with an increase in smaller incidents like hate-related property crimes. 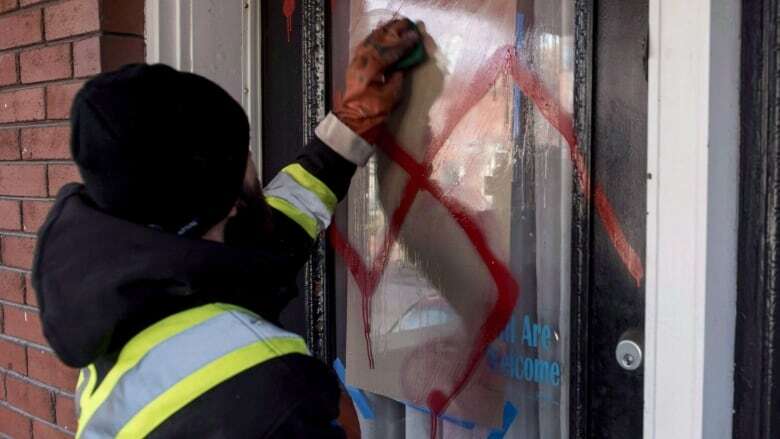 Toronto police's hate crime unit said it investigated 186 incidents — largely vandalism and graffiti — in 2017. In nearby Hamilton, police reported an 18 per cent increase in the number of what the force calls hate and bias incidents. Overall, Ontario saw a 207 per cent increase in hate crimes against Muslims, an 84 per cent increase in crimes against black people and 41 per cent increase on incidents against Jewish people. Alberta and British Columbia also reported increases in the number of incidents. Brittany Andrew-Amofah, of the Toronto-based Urban Alliance on Race Relations, said the increase in hate crimes is making communities feel less safe. "It's time for political leaders to unequivocally speak out against hate and intolerance and in support of a multicultural society where everyone feels safe to participate and contribute," she said in a news release. Avi Benlolo, President and CEO of Friends of Simon Wiesenthal Center for Holocaust Studies, issued a statement saying while the new statistics aren't surprising, they are alarming. "It's disturbing to hear that hate crime continues to increase in Canada and that the Jewish community – a community that is integrated into the Canadian mosaic — is still victimized," he said. Across Canada, black people remained the most common targets of hate crimes based on race or ethnicity. Some 16 per cent of all incidents involved black victims. Two per cent of police-reported hate crimes involved Indigenous people, according to the report, but it suggests a large number of all victims — possibly as high as two in three — didn't file reports with authorities. 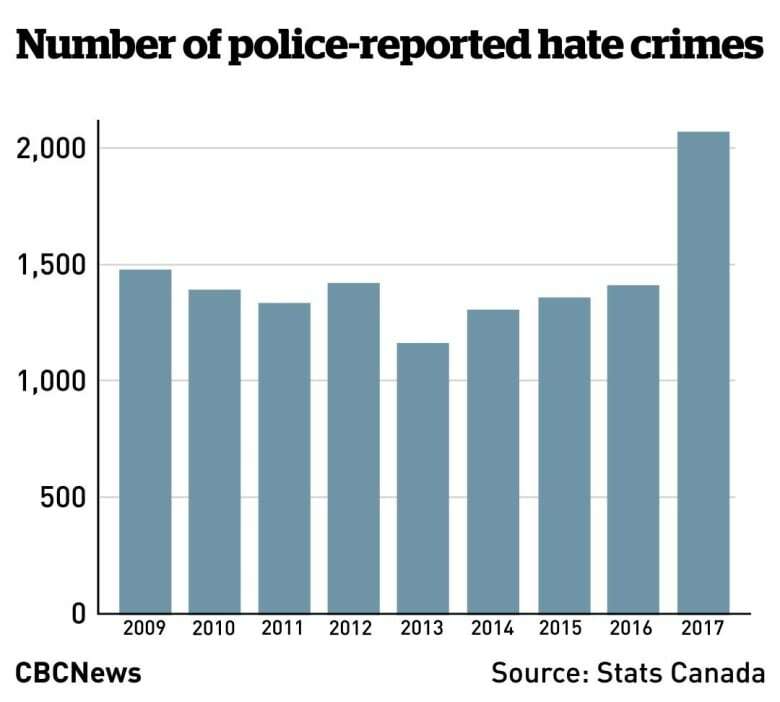 Hate crimes account for 0.1 per cent of the more than 1.9 million non-traffic crimes reported by Canadian police services in 2017. The agency defines hate crimes as "criminal incidents that, upon investigation by police, are found to have been motivated by hatred toward an identifiable group."